← What happens when a Young Earth Creationist discovers a 60,000,000-year-old fossil? 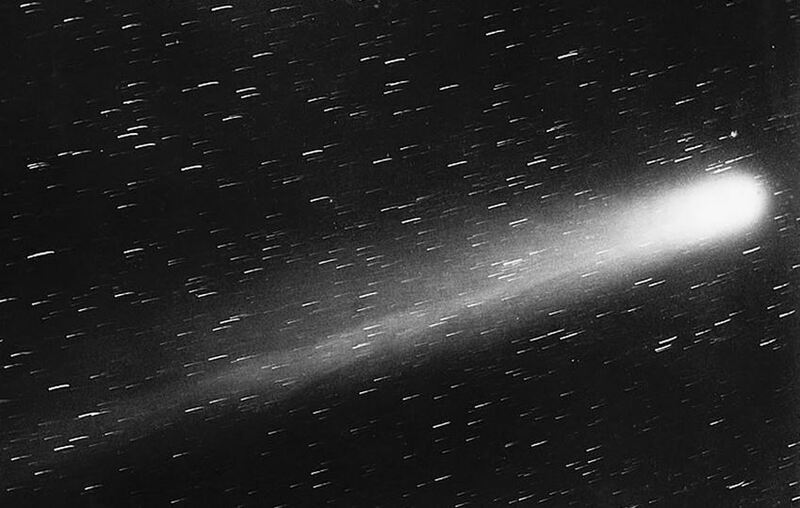 Halley’s Comet, photographed in 1910. No, it is not the gods – no mortal ever approached nearer. If Edmond Halley had not been in Sir Isaac’s life, we can wonder how many months (or years) might have slipped away before Newton’s master- piece would have been published. Perhaps the dour Newton would have simply disappeared deeper into his mysticism and alchemy, waiting for the ichthyographics to sell out and money for publishing to show up. (The History of Fish never did sell out. Somewhere in a Royal Society warehouse, there is probably still a stash of the notorious fish books.) Without Halley stepping forward with money, Principia would not have been published on this day, June 2, back in 1686. The minutes of the Royal Society record that Halley would “undertake the business of looking after it and printing it at his own charge.” De Historia Piscium was so unpopular it nearly bankrupted the Royal Society. Not only was the society unable to fulfill its promise to publish Newton’s Philosophiae Naturalis Principia Mathematica, but shortly after Halley personally financed Principia, the society quit paying Halley (the Society’s clerk) his annual £50 salary. Thoughtfully, Halley was paid with some of the left-over copies of the fish book. He gave away many of those. Today’s blog piece, inspired by Halley’s gift of Principia to the world, celebrates Edmond Halley’s life. Edmond Halley was much more than the comet he never named. Halley’s Comet was noticed at least by 240 BCE, but every time it returned (roughly each 76 years) people assumed it was a different comet. Halley figured out it was the same icy orb and he predicted its revisitation would be in 1758, and it was. The famous comet was named as an honour to Halley by French astronomer Nicolas de Lacaille, 20 years after Halley’s death. Halley’s was a life more than either the eponymous comet or the 1950s Rock’n’Roll so many people associate with him today. Portrait of Edmond Halley by Thomas Murray, 1687. I want to claim Halley as a fellow geophysicist. He built upon Sir William Gilbert’s discovery that our planet has an iron core which generates the Earth’s ambient magnetic field. Gilbert, working 80 years before Halley, could not explain polar drift (the magnetic North Pole is always wandering around) even though polar drift was well-known by sailors at least a century before Gilbert. In fact, Gilbert tried to disprove drift at one time because it was incompatible with his idea that the core was solid. If the core were solid, there should be no magnetic drift. Edmond Halley had a solution to the magnetic pole’s drift. His idea suggested that extreme internal pressure gives the Earth a solid iron heart, just as Gilbert hypothesized. But Halley noted that the crust we stand upon is also obviously solid and it made sense that a fluid area separates the solid core from the solid surface. (He proposed that there might be “hollow” layers filled with fluids or atmosphere between the solids.) Halley believed that it is the fluid part of the inner Earth that produces our magnetic field. Because of sluggish rotation of that fluid material during the planet’s spin, the magnetic pole drifts. Halley was partially correct in all of this, even though the details were tenuous, as we would expect from 17th century geophysics. Halley was certainly right when he identified distinct inner-earth layers, even if there is likely no hollowness involved. He had a knack for creative thinking and unbridled curiosity in other areas of science, too. Halley said that solar heat was the cause of wind. He discovered the relationship between barometric pressure and elevation. He perfected the diving bell, allowing himself to be submerged for nearly two hours, 60 feet below the filthy surface of the Thames. Emerging too quickly, he was also the first person to suffer from a recorded case of inner-ear barotrauma. Perhaps the daring flirtation with death also inspired him to create some of the first actuary charts. In 1693, he analyzed age-of-death statistics, making it possible for the English government to sell life insurance policies priced appropriately for each age of purchaser. In 1676, Halley sailed to Saint Helena island, south of the equator, and made the first atlas of the southern night sky. While there, he used a pendulum to determine that gravity was different than it had been in London. He watched Mercury transit the sun and from his notes, he found a way to calculate the absolute size of the solar system. Astronomy was his keenest interest. After returning to England, he worked as the Royal Astronomer, however he didn’t get the job he wanted most. 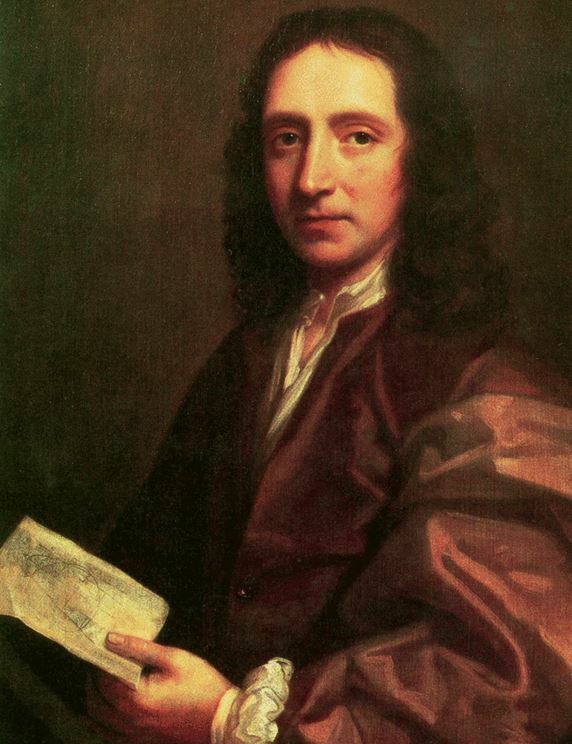 Halley was not awarded the position of Professor of Astronomy at Oxford – the Archbishop of Canterbury squashed the appointment due to Edmond Halley’s well-known atheism. But today, on the 329th anniversary of his offer to print the most famous (and perhaps most important) physics book in history, we commemorate that it was Edmond Halley who edited his friend Newton’s great study of physics, Principia, then printed it with his own money when the Royal Society failed to find the cash. Ours is a better world for Halley’s many gifts. This entry was posted in Biography, Culture, History, Uncategorized and tagged Edmond Halley, inner Earth, Newton, Principia. Bookmark the permalink.